One of the last meals my paternal grandmother ever made for me was her ethereal chicken soup. Unexpectedly, the broth that afternoon contained slices of sautéed shiitake mushrooms and flecks of sundried tomato. “I saw them at the market,” she shrugged upon setting the steaming bowl in front of me. I shouldn’t have been surprised. By that point, Grandma, at 91 years of age, had served up a lifetime of staggeringly good meals. And though she wouldn’t know umami from Miami, she knew intuitively how to make good things taste even better. She watched me eat—while, of course, insisting that I eat more—and that meal, like so many of hers, reminded me that it’s OK to disrupt traditions, to gently push them forward and in new directions. 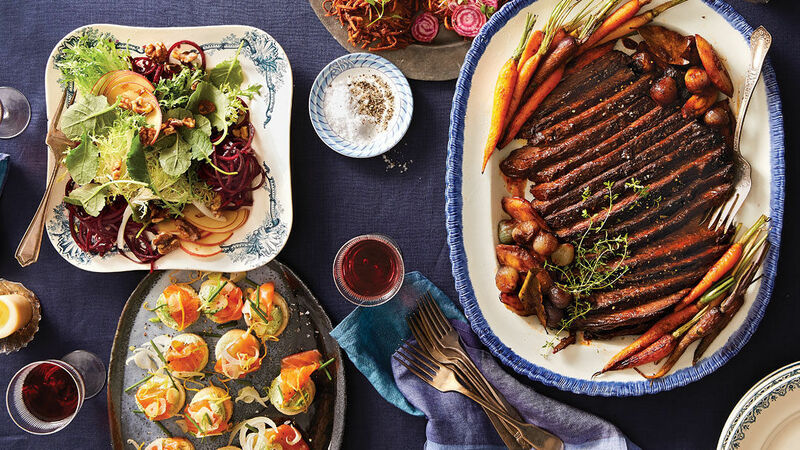 So I’m sure Grandma would have loved this Hanukkah menu, with its respectful twists on traditional offerings. The challah toasts that lead off the meal, for example, are reminiscent of the classic Sunday bagel, albeit one that’s gussied up for a holiday soirée. 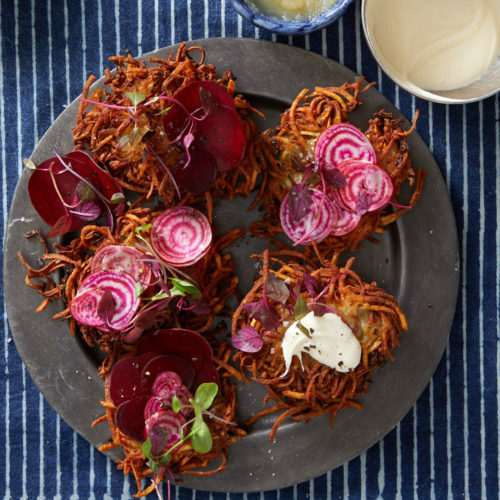 Likewise, here, the latkes—and what Hanukkah spread would be complete without lacy, crispy, salty latkes?—are served along with the salad, a sophisticated mélange of apple, frisée, and marinated beets. 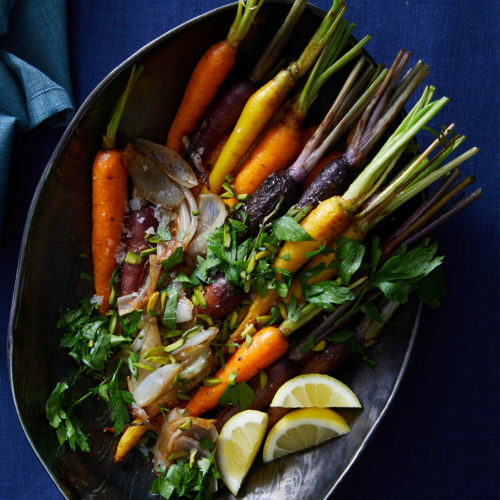 sweetness of the tender carrots. 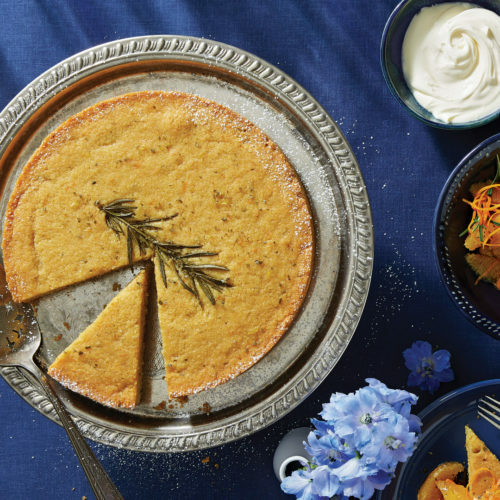 Finally, a rustic orange-rosemary cake punctuates the meal. Olive oil, so rich in Hanukkah symbolism, imparts fragrant richness to the cake’s cornmeal crumb, while a syrup with orange segments and a dollop of crème fraîche elevate the homey cake to holiday worthiness. Season the brisket and prep the vegetables for the braise. 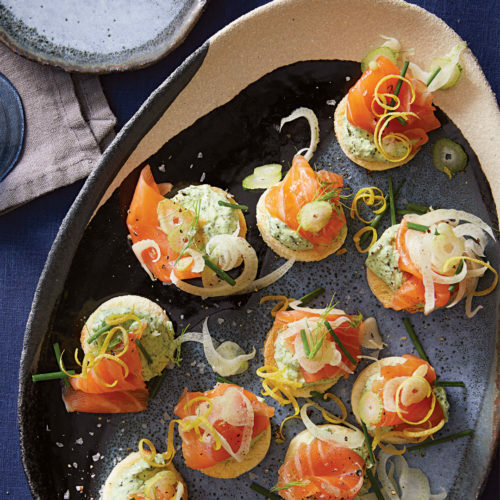 Make the dill cream cheese. Cover and refrigerate. Peel and trim the carrots. Slice the shallots. Cover and refrigerate. Wash and dry the frisée. Make the dressing. Marinate the beets. 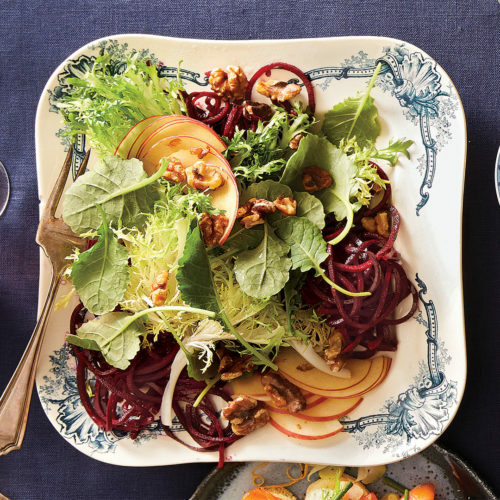 Toast the walnuts for the salad. Bake the cake, and glaze it with the orange syrup. Store covered at room temperature. Make the latkes, and hold in a 200°F oven. 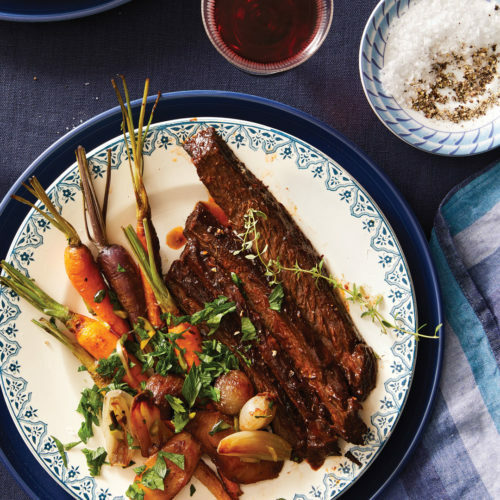 Slice the brisket, and hold it in its sauce in a 200°F oven.